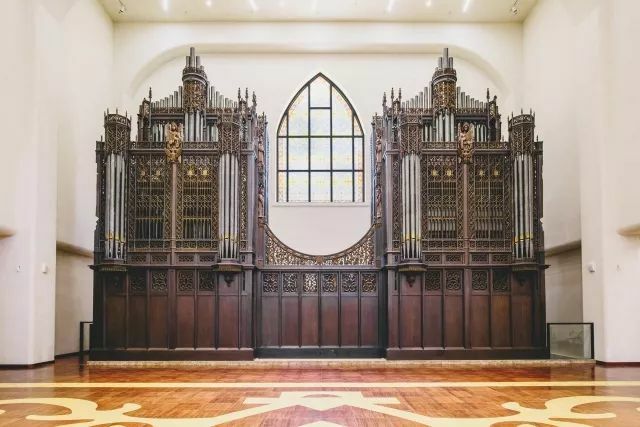 On July 8, 2018, after the painstaking four-year process of restoring a magnificent 19th-century pipe organ from Boston, Massachusetts to Kulangsu Island and building the organ’s new home—an acoustically ideal historic replica of its original chapel—the new Kulangsu Pipe Organ Art Center was officially unveiled to the public, and it will be open for visitors starting August 1, 2018. The Boston-Lingguangtang Casavant Opus 700 is considered a single instrument, but it is really two pipe organs, not one. The two sets of soaring, sonorous horns and whistles and bells face each other from opposite sides of the chapel. Each of the two organs has a completely different texture and color of sound: a British-style “Altar Organ” and a French-style “Gallery Organ.” Together, the two form one giant stereo organ that envelops the listener from both sides across a frequency spectrum that pushes the limits of the human hearing capacity, a range wider than that of a symphony orchestra. The Casavant Opis 700 is an instrument and listening environment completely unique in the world. 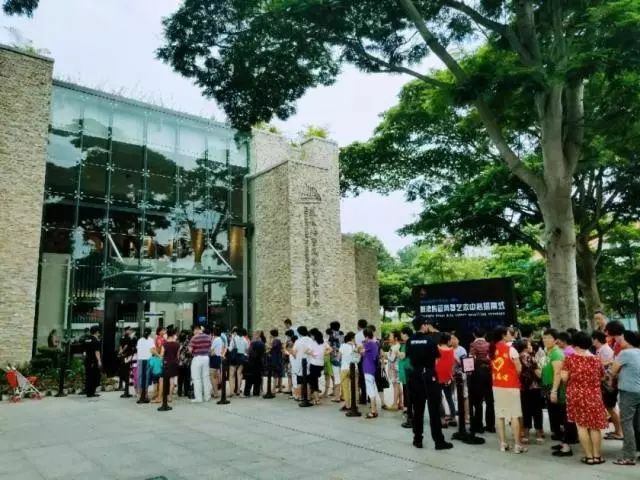 Kulangsu Island, Xiamen’s pedestrian-only enclave known for its historic international settlement and nicknamed “Piano Island” for its classical music tradition, became a UNESCO World Cultural Heritage site in 2017. 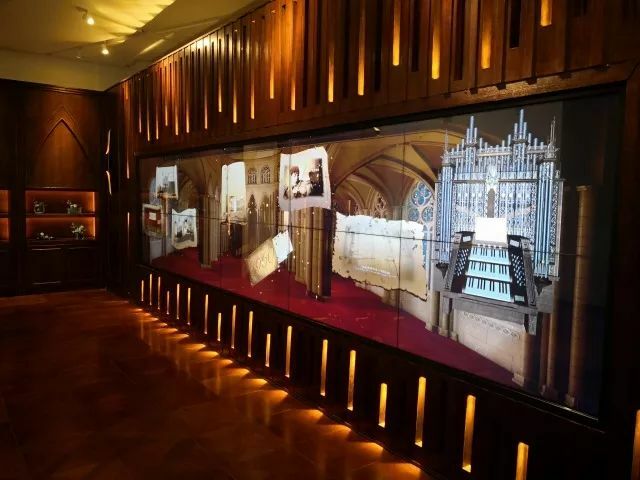 The Pipe Organ Art Center has also planned a series of exciting activities to encourage residents of Kulangsu and other citizens to experience these spectacular new organs. The event could be described as an in-depth guided tour through the sounds of antique organ heaven. Visitors were able to hear and explore the centuries-old legend of the instrument and to take a look inside the organ to understand the sound principles of the instrument and its precise internal structure. 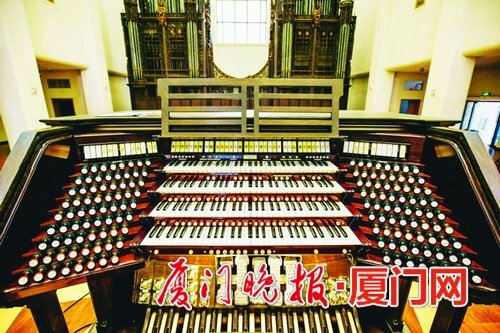 From July 8 to 11, the Kulangsu Pipe Organ Art Center held 6 concerts, and four famous organists participated in the event: Isabelle Demers, a professor of organ music and head of the organ department at Baylor University in Texas, USA, recognized as one of the most famous organists in North America; Thomas Tot, one of the most popular musicians in the UK, city organist in Birmingham, and organist at St. Margaret’s Church and Westminster Abbey in London since 1983; organist Xin Dongyi, the winner of the 20th Chartres Grand Prix; and Ken Cowen, one of the top concert organists in North America, head of the organ project at the Rice University School of Music, and an organist and resident artist at the Palmer Memorial Anglican Church in Houston, Texas. In addition, four more musicians took part in the performance: accordionist Timofe Satolov, saxophonist Andrei Lakisov, double bassist Bernd Gesell, and violinist Lisa Shiheteng. The Kulangsu Pipe Organ Art Center is located at No. 1-4 Sanming Road, Kulangsu Island. It is an art palace designed for the Boston-Lingguangtang Casavant Opus 700 organ. It is also the first space devoted to antique organ collections and performances in mainland China. 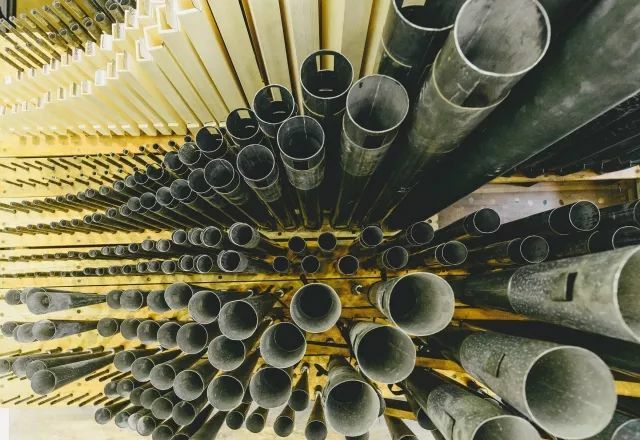 The Kulangsu Pipe Organ Art Center will focus on public education and promotion of the musical arts through high-quality events, such as the world’s top-notch organists coming to Kulangsu to play concerts and hold master classes. In 2007, Kulangsu’s own Hu Youyi purchased the Boston-Lingguangtang Casavant Opus 700 organ from the United States and donated it to his hometown. 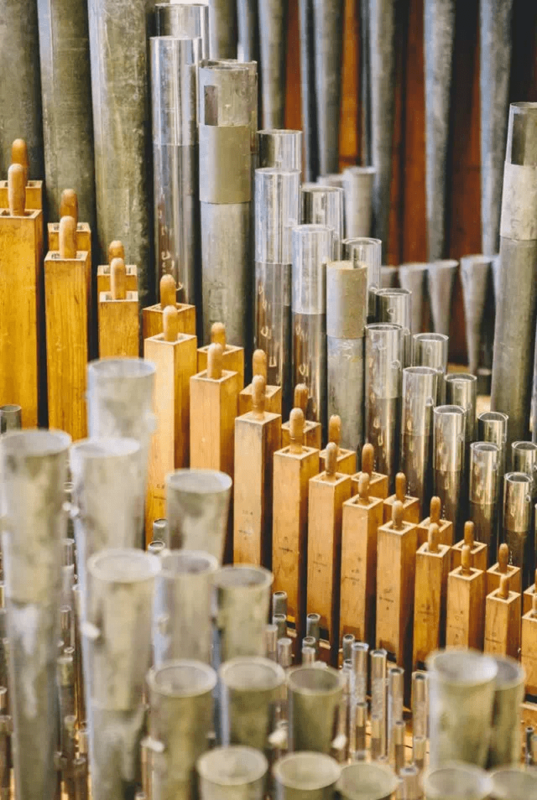 In 2014, the municipal government commissioned the Austrian Rigel Organ Company to repair the organ, which lasted for 4 years. More than 40 organ repair experts from more than ten countries including the United States, Germany, Austria, and Switzerland participated. Considering the cost, duration, and complexity of the process, as well as widespread international cooperation, it can be considered one of the most remarkable organ repair projects in world history. – Fact #1: The restored organ arrangement is consistent with the Boston-Lingguang Hall, which is more than a hundred years old. Visitors can walk inside the organ. – Fact #2: The organ consists of two different pipe organs, one on each side: a British-style “Altar Organ” and a French-style “Gallery Organ” that form one giant organ. This is rare in the history of musical instruments, and its historical value is immeasurable. – Fact #3: The Gothic look of the “Altar Organ” and “Gallery Organ” is consistent with the Gothic style of the church. Its classical oak is finished with complex and ornate sculpture work, completely handmade. – Fact #4: The sound is a symphonic style. It is typical of the early 20th century, but it also meets the requirements of a modern concert hall. The sound of the keys can be majestic or delicate, and the sounds are varied and versatile enough to be able to imitate different musical periods throughout history. – Fact #5: The restored organ is implanted in the Austrian organ factory Rieger’s unique REA electronic system technology, which not only enables the automatic playing of ancient instruments but also can achieve tens of thousands of combinations of sounds for the use of musicians. Visitors to the Pipe Organ Art Center can this hear the organ playing by itself at all times of day, 7 days per week, outside of the concert schedule. – Fact #6: The organ stage can be moved, while the traditional mechanical European and American centuries-old guqin can only be fixed in a concert hall or church and cannot be moved.